Just another quick post tonight to show the nails I wore for my little big boy's 5th birthday today. 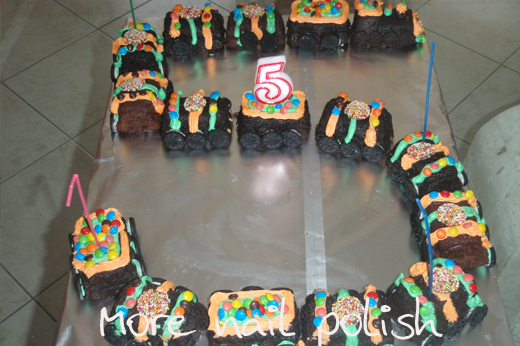 The green and orange stripes matched the green and orange icing on his 15 carriage train cake. I printed a quick little temporary tattoo of his happy little face for my ring finger and stamped the number 5s from some stamping plate in my folder than I can't be bothered checking the brand and number of now. After today's birthday events, I have a couple of broken corners off my nails and will be filing them down more tonight. I tell you, I have never build so much lego in one day EVER! A shot of the epic long train cake. My gorgeous happy little guy. He had so much fun today and was up until 9pm tonight still playing with his new toys. Aww, this is seriously the cutest mani ever! It's so awesome! You should show him when his older haha :) Hope he had a good day! Happy Birthday to your handsome young man! Awesome cake and nails! I just love what you do with your home-made temporary tattoo decals. Aw, what a cutie! Happy Birthday, Bayden!!! Star Wars shirt! 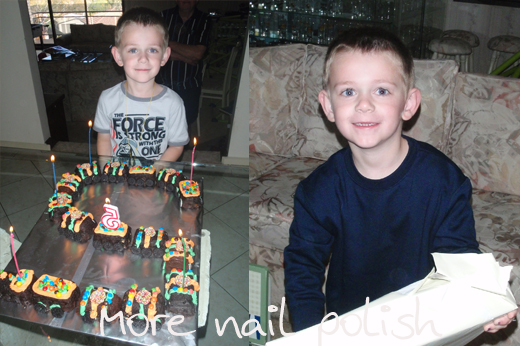 Clearly he has great taste ;P Happy birthday to the handsome little man and congrats on a super cute mani! Bayden is gorgeous, happy birthday to the little man! Love your manicure too, and that cake looks delish! awesome train cake =) Happy Birthday big boy and Happy mummy! What an amazing mum you are, that cake, those nails and his happy lil face! Hope you guys had a great day! Would love to see a link to your last birthday nails if you have one? These are awesome nails, and what a great cake! Gorgeous cake and he's so cute! Funny, my little girl turned 5 today too! 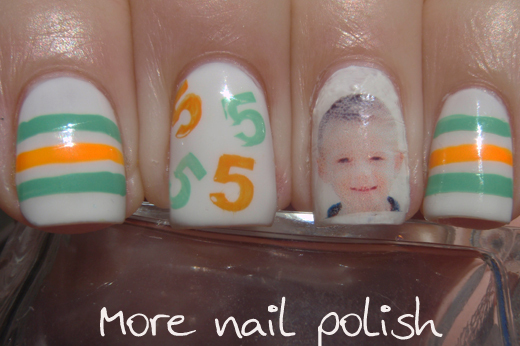 Great idea wearing his picture as part of your mani - I'll try to have to remember that next year! how did you get a temporary tattoo printed??? i love this idea, i just had my son and would love to do this! I need to know how you did the tatoo too! !